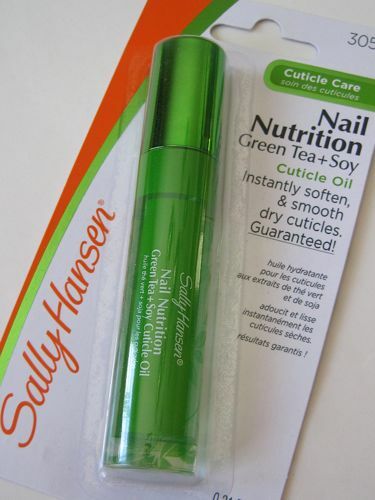 This winter my hands and nails have seemed super dry, so when I was in line at T.J. Maxx last week I nabbed this package of Sally Hansen Green Tea + Soy Cuticle Oil. 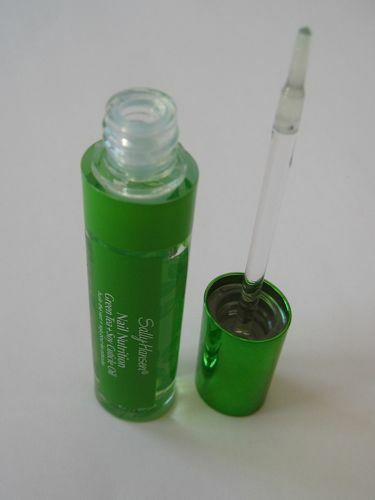 When I opened the package, I was expecting some sort of roller ball thing but I realized it was a brush-on liquid, just like lip gloss. 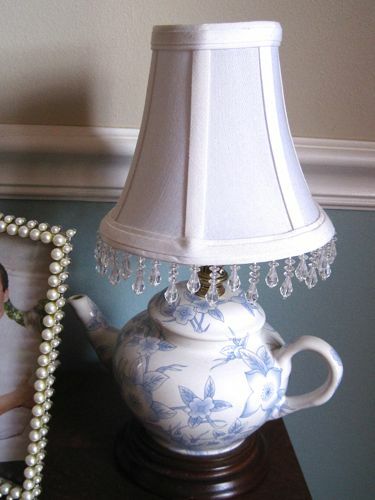 See this sweet little teapot lamp? It was a gift from a friend several years ago, and it's been tucked away in an upstairs room just waiting for the time when it would be promoted to everyday use in the living room. I recently switched out a too-big-for-this-space desk with the melodeon, a type of reed organ, that was passed down in my husband's family. 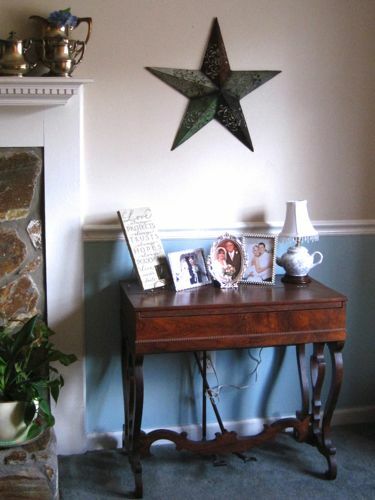 Its small size suits this space perfectly, but it needed a little accent, and that's when I decided to fetch the prized lamp from upstairs! The design of this piece is just perfect here, and it's almost like getting the gift all over again! A couple of times I have made those knock-off biscuits that taste like the Cheddar Bay Biscuits at Red Lobster. 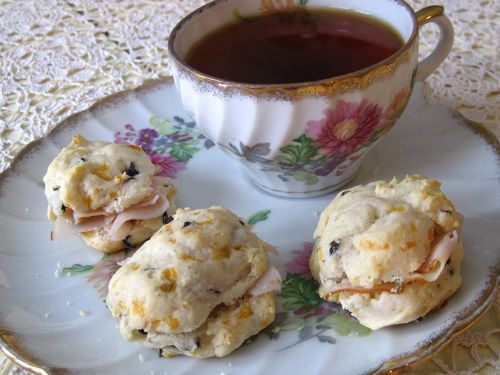 It's so easy to make those (and recipes are all over the Internet) that I started to think how easy it would be to use these for tea sandwiches by making miniature biscuits using a similar base of Bisquick, water, and cheese — but without the buttery garlic topping. I played around and came up with these Miniature Olive & Cheese Biscuits, and I just loved them! In fact, I used them as "sandwich bread" and enjoyed three mini-biscuits with thin-sliced turkey for lunch one day. 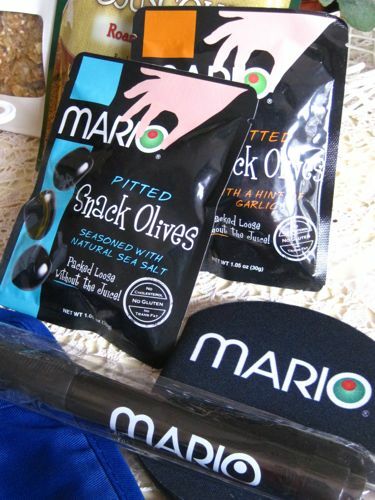 The Mario brand of black olives I used came from the swag bag I got at the Food Blog South conference over the weekend. 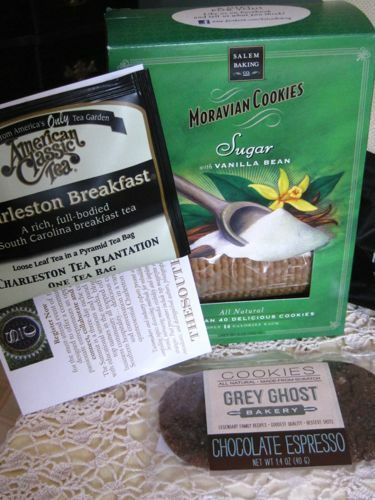 ... including a sample of Charleston Tea Plantation Tea, some Grey Ghost cookies, and a box of those Moravian Cookies you've probably seen in the Harney catalog. 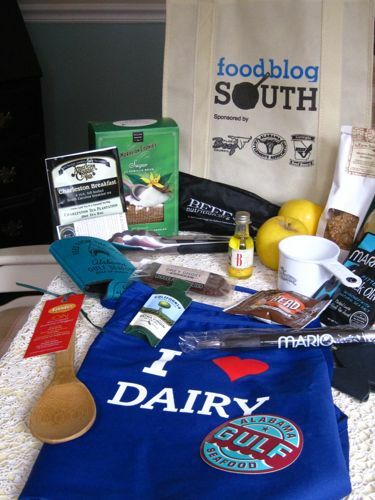 Delicious freebies, all! 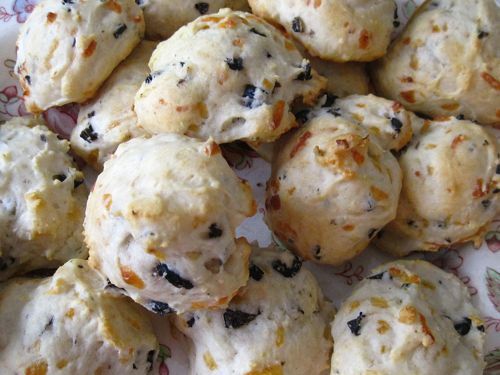 The olives, however, are what inspired me to make the miniature biscuits, and here's the easy recipe. Preheat oven to 375 degrees. Add all ingredients to a medium-size mixing bowl and stir just until combined. Drop by heaping teaspoonful onto greased baking sheet. Bake for 12-14 minutes or until biscuits are beginning to brown. Yields about 30 miniature biscuits. Keep Calm and Carry On ... Shopping! Are you tired of this motif showing up everywhere? 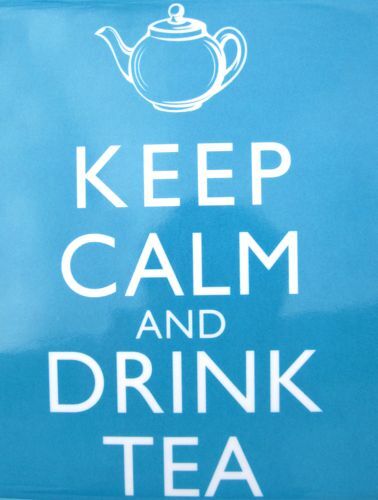 I thought I was getting to that point, but then I saw a new version of the saying and decided no, I can take a little more of the "Keep Calm" message after all! Last week, I had the fun (and pretty rare) opportunity to spend a day shopping with my sister and three of her four children. Near the end of the day, eight-year-old Amelia and I headed to Ross so she could spend the last of her Christmas money. One Barbie and three Barbie outfits later, she was D-O-N-E with her day of shopping. Selections in hand, she looked up at me and said, "OK, let's rock and roll!" and headed to the register. She's such a funny little kid! "But wait," I said, "you HAVE to let me check the tea aisle before we check out." Loud sigh and "Okayyyyy." Immediately I saw this tray and said, "Oh, I NEED this." Even Amelia agreed, saying, "Yes, you do. Can we please go now?" The price was certainly right (it's an 11-1/2 x 19-inch tray), and I love trays for display. These plastic ones are also good for transporting food *and* for office organizing of crafts, papers and more. Furthermore, I also picked up a great little item that will be part of my week of Valentine's giveaways on the blog this year, but of course I can't show you that just yet! So ... 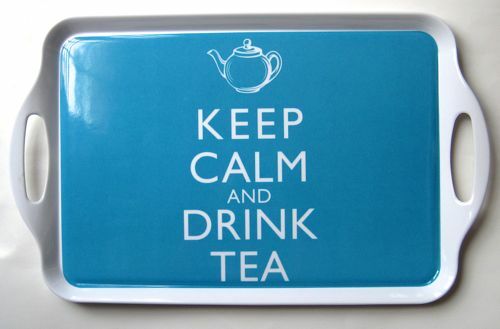 I'm curious if you are wearying of the "Keep Calm" motif or if, like me, you still like seeing it around sometimes! ... Lady Tesser! If you'll send me your snail mail address via the e-mail button at right, I'll get this headed your way. And let me just say that because of the interest in this giveaway (93 entries! ), I wish I had 93 of these to give away, but instead I'll do the next best thing and simply have more teacup giveaways this year. So stay tuned, friends, and you may join Lady Tesser in the teacup winner's circle later on this year! 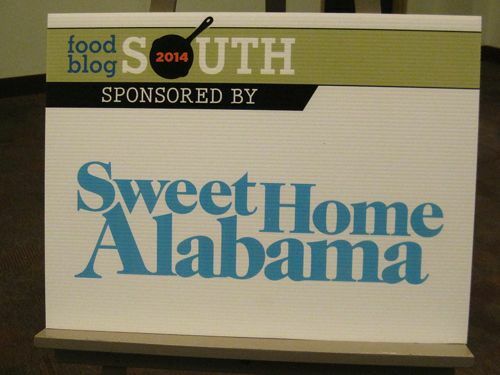 At the end of the year, I was reading a southern food magazine when I saw a listing for Food Blog South 2014 and decided to sign up. It's the fourth year food bloggers have gathered for this annual conference, and I'm so, so glad I went, and I thought you might enjoy hearing a little about it! 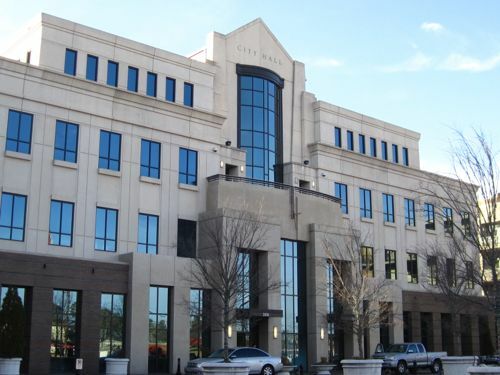 The conference was held at Homewood City Hall near Birmingham, Ala. It's a beautiful facility, and I realized after I'd registered that this is also where one of my husband's nieces got married a few years ago. 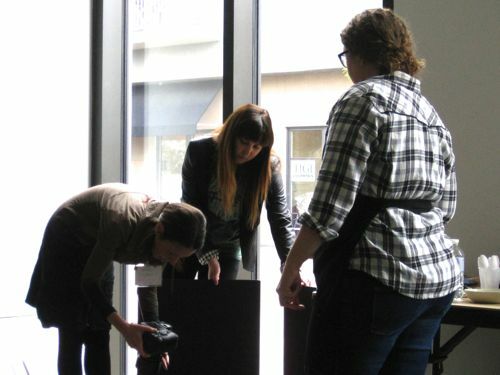 The main reason I wanted to attend Food Blog South is that one of the speakers was Hélène Dujardin, at right, a blogger and renowned food photographer and stylist, whose terrific book I wrote about here a few years ago. 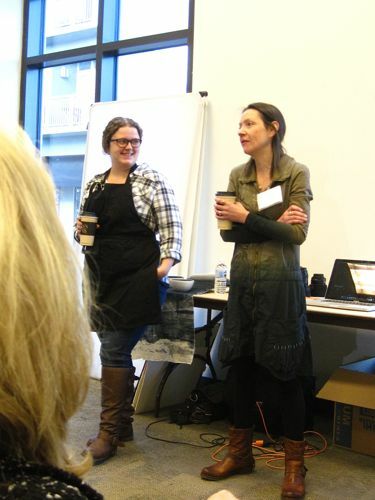 I was thrilled to be able to hear some of her tips and tricks, and I was also delighted to hear from her co-presenter, Tami Hardeman, at left, of the Running With Tweezers blog. They both came across as very down-to-earth gals, and I took notes as fast as my hands could scribble. 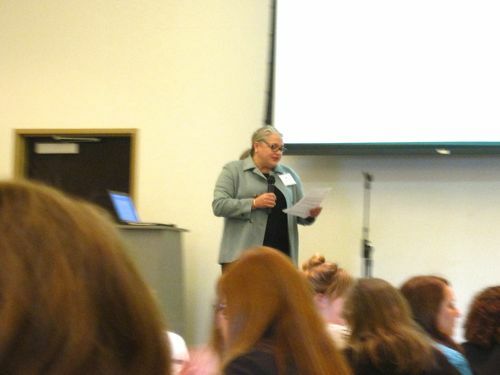 Another of the presenters was Cathy Barrow of the Mrs. Wheelbarrow's Kitchen blog. I loved hearing about the evolution of her blog, where her passions include preserving foods and finding locally-sourced foods. She also writes for other publications besides her blog, so as a freelance editor and writer myself I was taking lots of notes about how she went from a job in marketing to following her passion here. 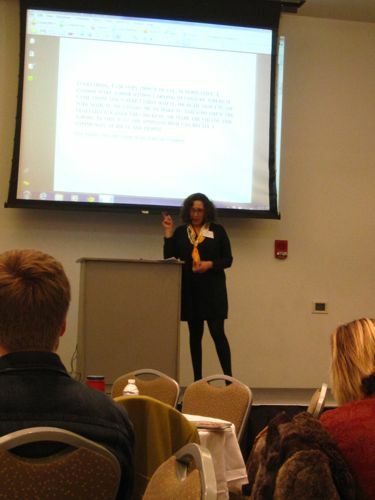 Hers was a very, very helpful presentation! 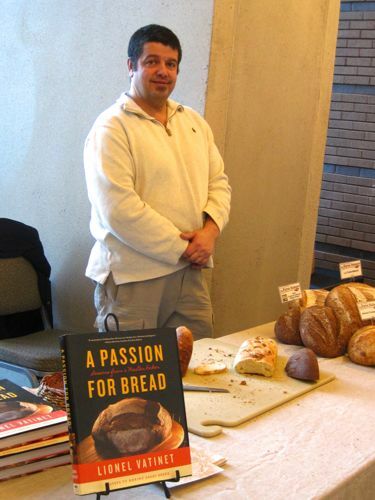 Some vendors had food displays during the conference, and everyone was drooling over the breads by Lionel Vatinet, whose book is called "A Passion for Bread." 1. I wasn't the only middle-aged woman there. I had assumed almost all of the attendees would be 20- and 30-somethings, but that wasn't the case. 2. Some bloggers are trying to get a full-time job out of their blog, but most of those I spoke with at lunch and during breaks were "hobby bloggers" like most of us tea bloggers. Also, some are simply trying to increase their online presence to perhaps help them sell a self-published book or get a book deal. 3. A lot of people talked about "maintaining your own voice" and having an "authentic" blog. I totally get that. I've always liked that old saying, "Be yourself. Everyone else is taken." 4. Did you know that some blogs with large followings on Facebook have bought and paid for some of those "Likes" on Facebook? Good grief! I can't imagine doing that. 5. So many bloggers spoke about the great friendships they've made through their blog, and I definitely agree! That, I think, is really why most bloggers blog. And may it ever be so! The Four Seasons and The Ritz-Carlton are two of the hotels in Atlanta where I have enjoyed tea, and over the years I've observed that many of my tea friends occasionally enjoy having afternoon tea at a hotel as well. 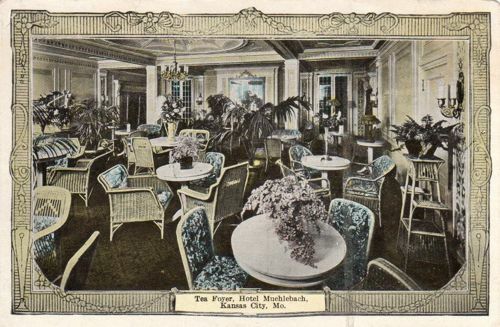 We've been doing that in this country for decades, and an undated postcard I found shows a quite splendid Tea Foyer at the Hotel Muehlebach in Kansas City, Missouri. I can practically feel all the wicker and touch all the chintz cushions and gloriously potted greenery in this amazing tea room! 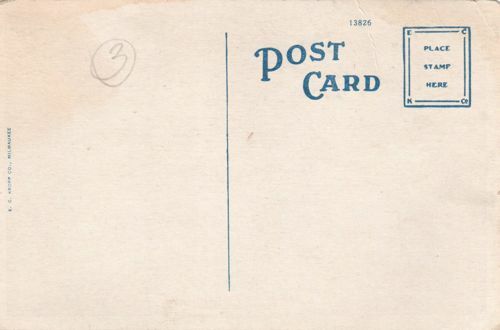 Alas, my postcard is unused, so I have no clue as to the date of this tea room. The often-helpful Wikipedia, though, informed me that this hotel building went up in 1915 and is still in use today. It's part of the Kansas City Marriott Downtown, a historic building that has been visited by every U.S. president from Theodore Roosevelt to Ronald Reagan. Harry Truman is said to have used the hotel for his headquarters when he went home to Independence, Missouri, and the hotel's other famous guests included Babe Ruth, the Beatles and Elvis! I'm such a political junkie that I would probably have been more excited about seeing Ronald Reagan than seeing Babe Ruth, the Beatles or Elvis. How 'bout you? Who would you like to have seen in the hallway on your way to tea? 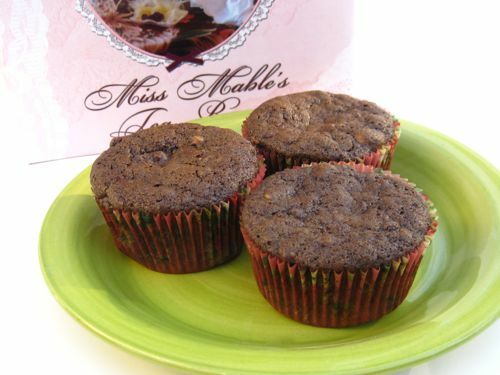 I get nervous if there isn't something chocolate to eat in the house, and I'd been wanting to try a new recipe from one of my tea room cookbooks, so this week I decided to make these easy and decadent Double Chocolate Muffins! 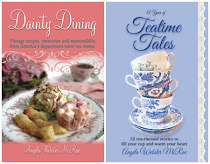 During my year of cooking out of tea room cookbooks in 2013, I had mentioned the book "Family Recipes from Miss Mable's Tea Room," a book I purchased as a souvenir when a girlfriend and I visited this Tennessee tea room some years ago before it closed. 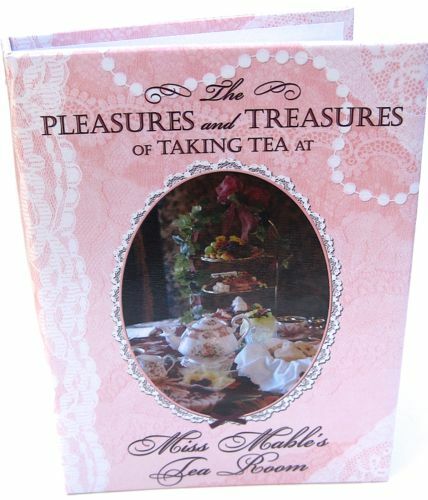 Several readers commented that they liked that book but they also liked a second cookbook from Miss Mable's, "The Pleasures and Treasures of Taking Tea at Miss Mable's Tea Room." Naturally, I couldn't rest 'til I got my hands on a copy of it as well. Now, is it a betrayal if I enjoy a muffin made with coffee as I'm sipping tea? I hope not, because all I can tell you is that the two types of chocolate AND the addition of brewed coffee made for an especially rich tasting muffin! Give these a try sometime and see if you agree. Combine flour, salt and soda. Add sugar, cocoa, nuts and chocolate chips and combine. 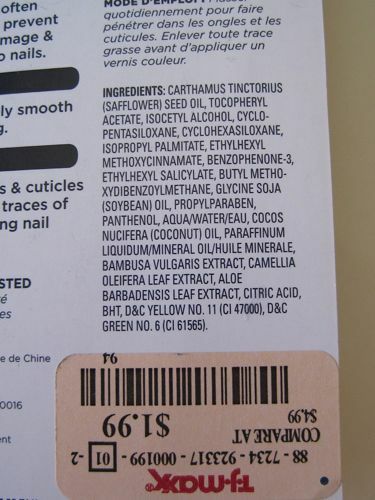 In separate bowl, combine the liquid ingredients. Stir the liquid ingredients into the dry ones and combine well. 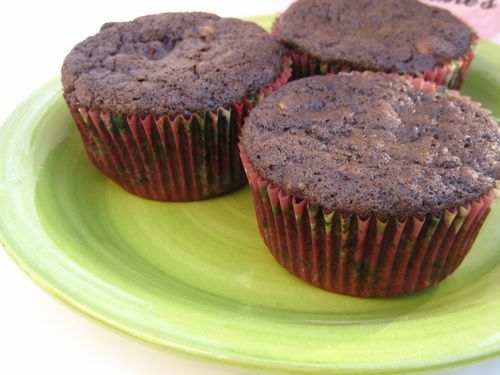 Spoon batter 2/3 full into paper-lined muffin tins and bake for 20 minutes or until muffins have risen slightly. Yields about 15 muffins. After sipping so many flavored and spiced teas lately, my palate seemed to long for the pleasant sensation of tasting a pure, unflavored tea. 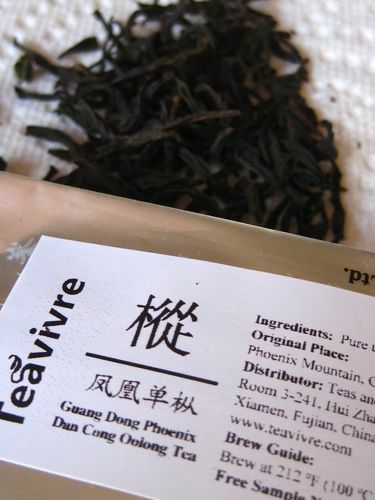 This week, I decided to try two new oolong teas I received from Teavivre recently. Right away, I was pleased to note the difference in the two teas' appearances. 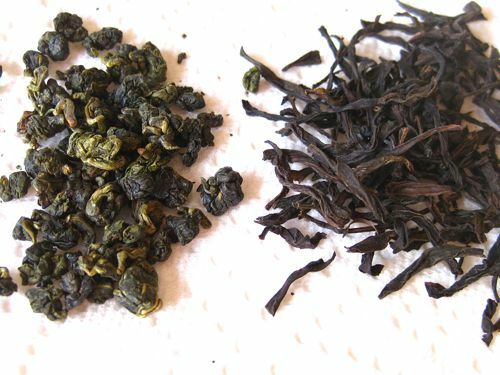 The one at left is Taiwan Jin Xuan Milk Oolong Tea, and at right is Guang Dong Phoenix Dan Cong Oolong Tea. 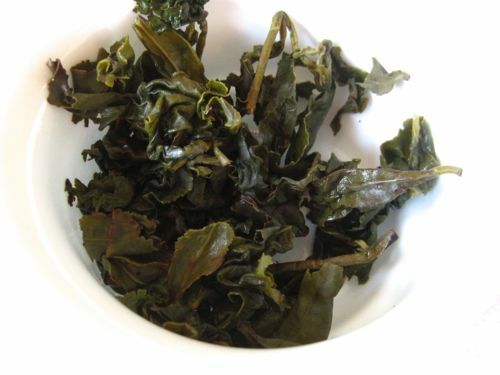 The Taiwan Jin Xuan Milk Oolong had a very fresh, slightly vegetal scent when I opened the sample packet of tightly balled-up leaves. Steeped, the tea had a very pronounced vegetal scent, like steamed spinach. I steeped a teaspoon and a half of the tea in boiling water for two minutes and it had a pleasant, vegetal taste with just a tad of astringency. 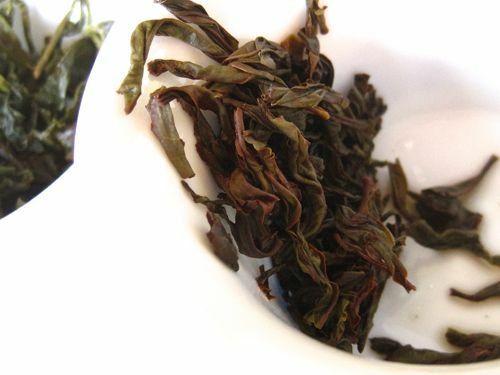 The Guang Dong Phoenix Dan Cong Oolong Tea looked much different, with long, wiry tea leaves. This tea had more of that scent I often compare to wood or pencil shavings. I steeped a teaspoon and a half of it for two minutes in boiling water as well. Steeped, the tea surprised me with a very, very fruity fragrance, almost grape-like, it seemed. 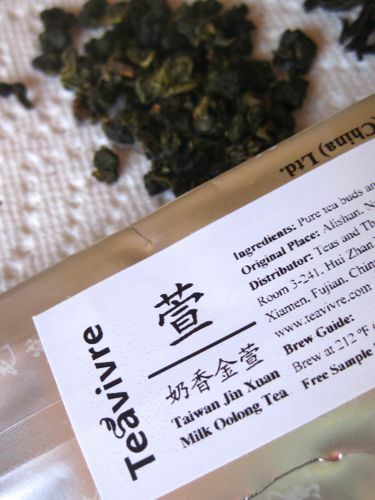 The taste was pleasantly fruity as well, and though I liked the first oolong, I absolutely loved this one! It was fun to try two new oolong teas at the same time, and I do believe I may try this method again sometime! Recently I came across an old but familiar name in publishing, Leisure Arts, a company whose cross-stitch booklets I bought by the dozens in the eighties and nineties. I haven't seen the Leisure Arts logo in years, so when I came across a great buy on some Leisure Arts cookbooks at Tuesday Morning this week, I was hooked. 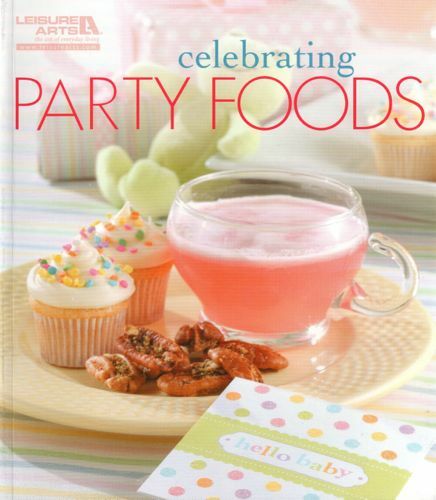 What intrigued me most about "Celebrating Party Foods," curiously enough, is how pretty that simple glass punch cup looks on that yellow ceramic plate on the cover. I suddenly recalled that a few cookbooks I've received as gifts from friends were from Leisure Arts, and I loved them for the very do-able food and gift ideas. 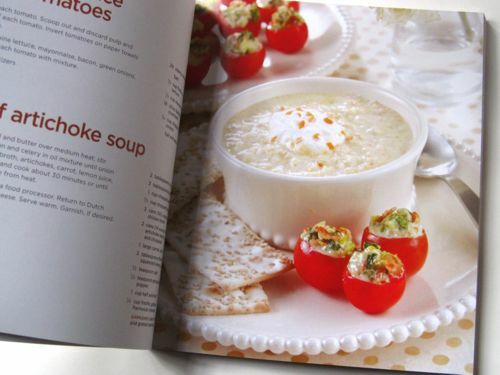 This book definitely made me recall those old favorites, and I got so many great ideas, like serving stuffed mini-tomatoes on a plate with a cup of soup. There's just enough room for the tomatoes and a couple of crackers, but look how this takes the presentation up a notch! 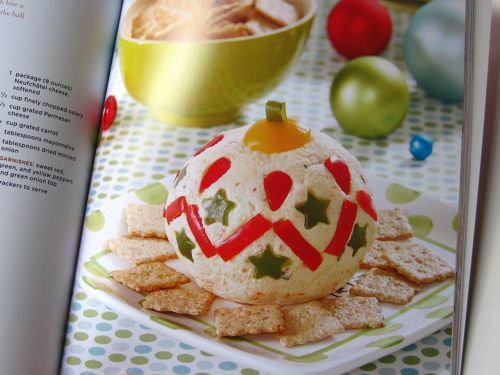 What closed the deal for me, though, was this picture of a festive cheese ball designed to look like a Christmas ornament. Last year I searched in vain for the perfect *easy* appetizer to take to my garden club's annual Christmas party, and if I had seen this, this is what I would have made! The book has recipes for party foods to celebrate the whole year, and I was delighted to find a Sparkling Fruit Tea recipe among the beverage offerings. Among the many sweets, I'm eager to try the Cranberry-Pear Rolls made with apple pie spice and the Cookies 'n Cream Cake featuring a beloved chocolate sandwich cookie. 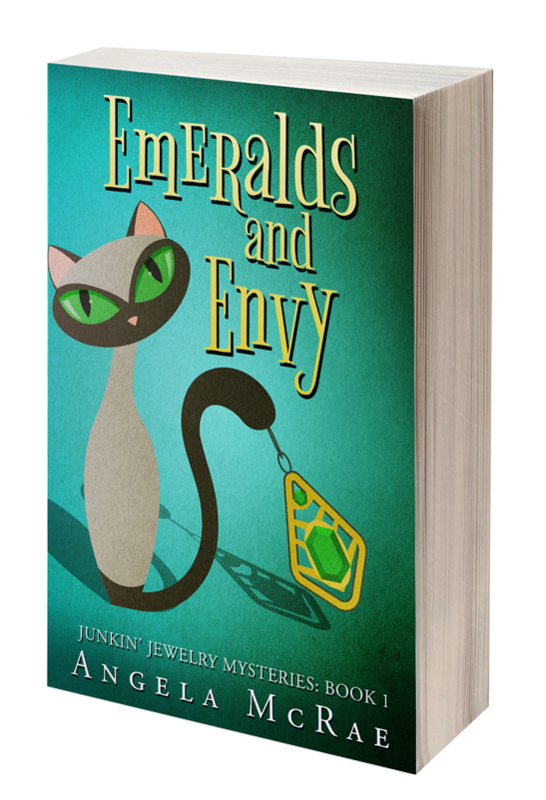 Best of all, the $14.95 book was just $2.50 at Tuesday Morning, so if you have one of the stores nearby you may want to take a look! 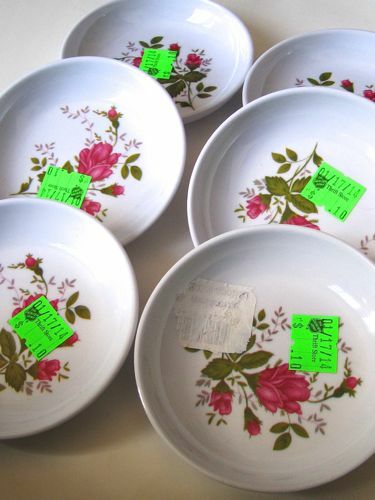 Now that the thrift stores in neighboring Carrollton are on my shopping rotation, I've made a few observations: 1) They have a nice selection of junk. 2) They seem to turn over their merchandise pretty frequently. 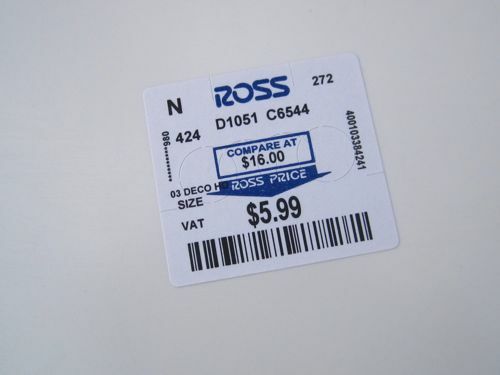 3) Their prices are great! 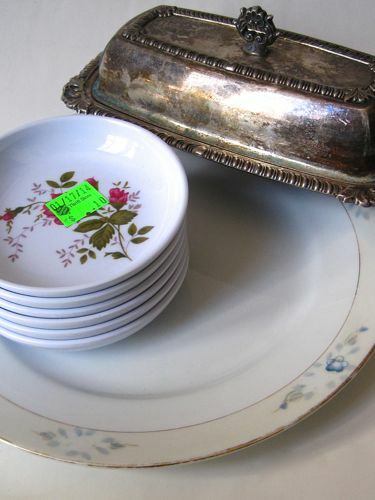 Recent finds included these butter pats and a plate (Salvation Army) and a silverplate butter dish (Goodwill). I'm calling these melomine dishes "butter pats" because that's what I thought they were when I saw the little stack of them, but then I picked them up and realized they were just plastic. Rats! But then I stood there and thought, "Hmmm. Maybe these could be used when having tea outdoors? Or on a tea picnic? Hmmm." Since they were just 10 cents each, I knew I'd probably regret NOT buying them far more than I would buying them, so they jumped into my bag. I've been wanting to try some sugar cookies with pale blue icing, but it occurred to me I don't have any plates with pale blue to serve them on. This one was a quarter, and I liked it for a weird reason: it's flawed! 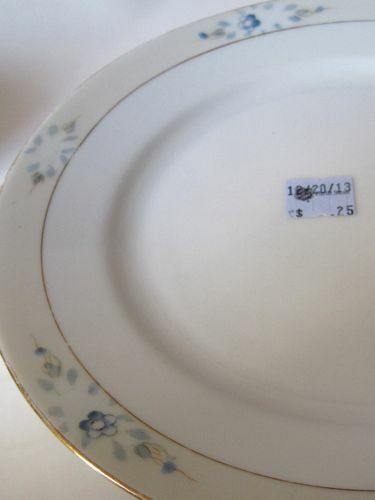 You see, this plate doesn't have any nicks or chips, but unlike the other plates in the stack, this one is missing the pink roses in the design. If you notice the little blank spot next to the blue flower, that's where a pink rose was supposed to be. I don't think it's faded either; it really looks like the paint or decal or whatever didn't make it onto the plate! 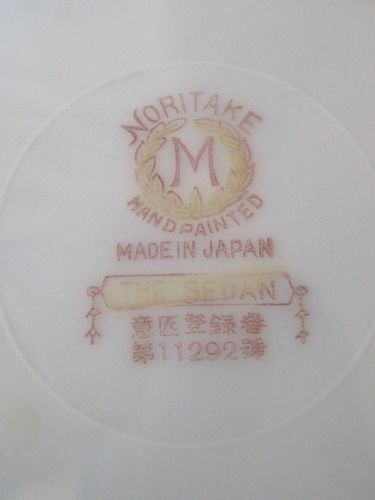 Still, I like my 25-cent plate, whose backstamp says it's by Noritake and the pattern is "The Sedan." 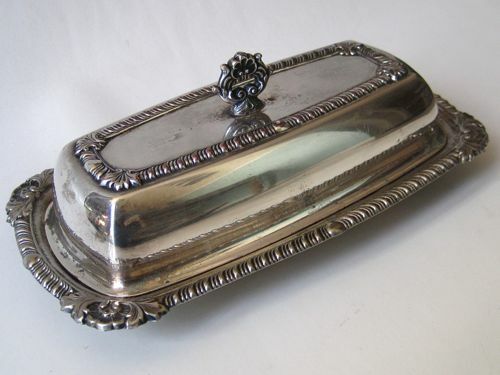 My splurge was this $2.42 Cross silverplate butter dish. 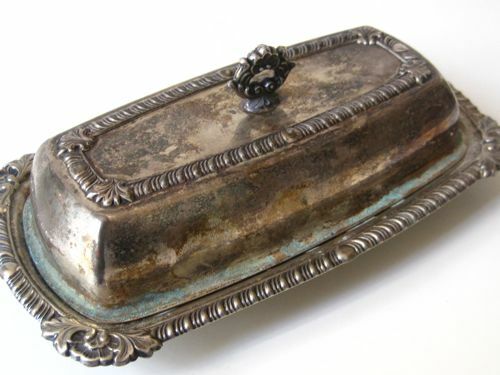 I've wanted a pretty silver butter dish for a while now, and the price was certainly right, but I wasn't sure if the tarnish and the verdigris looking spots would come off. I'm happy to report that after just a little polishing the butter dish already looks fairly presentable. A bit more elbow grease and I think this will be worthy of the tea table! Do you shop at thrift stores where you live? If so, what do you look for? 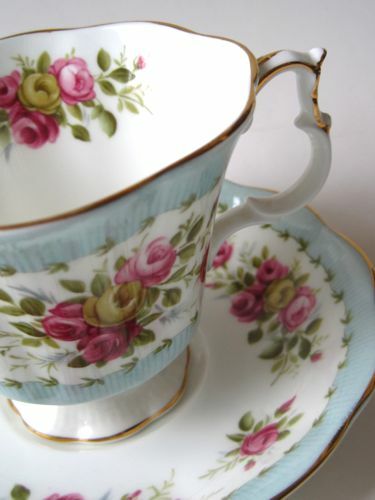 A Royal Albert vintage teacup giveaway! 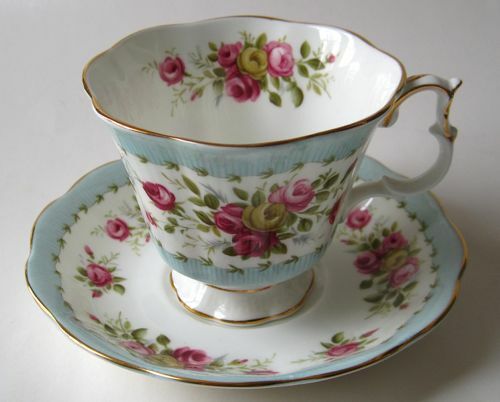 This year I want to host at least one giveaway a month, and since January is marching along I thought it would be nice to kick off the week with a giveaway of this rosy Royal Albert vintage teacup and saucer! 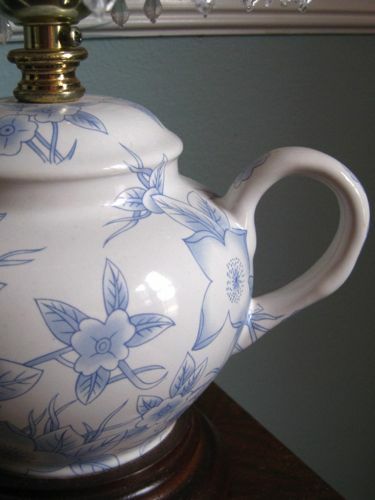 The cup's got a pretty shape and a lovely scalloped handle, and I do believe one of you might enjoy using this set. 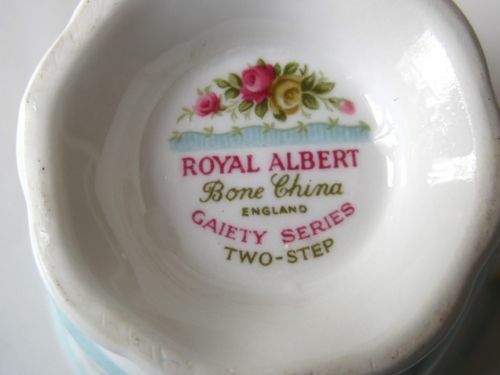 The pattern is called Two-Step, and I wanted to let you know it's part of the Gaiety Series of cups and saucers in case you'd like to fill your dance card with the rest of the patterns in the series! At any rate, I hope you will be doing the two-step when you win! To enter, just leave an "Enter me" type comment between now and 7 a.m. next Monday, Jan. 27, and you just may be the winner. Giveaway open to all residents of the U.S. and Canada. Good luck! With this week's postcard I'm starting to see a little bit more of the feminine tea room look I'm accustomed to, rather than the "lunchroom" type settings of the tea rooms in the first two postcards I shared this year. 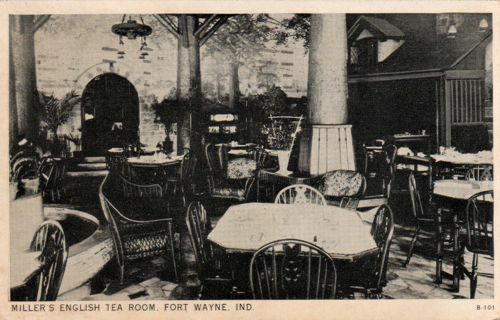 I've never heard of Miller's English Tea Room in Fort Wayne, Indiana, but it looks like a pretty place, and I especially like what I believe is a fountain at left! I'm not sure if serious postcard collectors (which I am not!) prefer postcards be used or unused, but the storyteller in me will always, always prefer to find a story to go with the photo. This one, sent to Mr. A.P. Welsey of 44 Curtis Ave. in Woodbury, N.J., reads, "Ten o'clock Sat. morning. Pearl & I just finished breakfast. She was on the platform to meet me. The train was 40 min. late. Love-Esther." Was A.P. Esther's husband? Was Pearl her sister, or perhaps a friend? 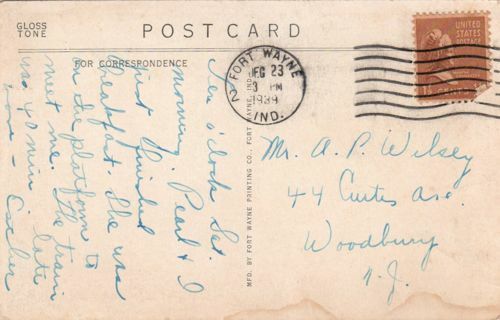 This card is postmarked Dec. 23, 1939, and I also have to wonder if perhaps Esther and Pearl discussed that hot new movie "Gone With the Wind," which had just premiered eight days earlier in Atlanta. At any rate, it's fun to see what a tea room interior looked like in 1939! Are you a fan of ginger? I am. 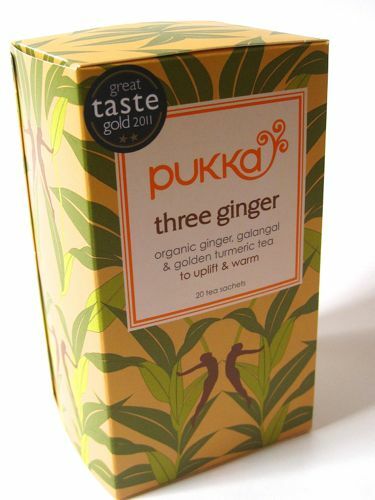 I love the spicy flavor and the little zing it gives to food and drink, so this week I tried a new herbal tea with ginger, Pukka's Three Ginger Tea. When I opened the box, I was surprised to find individually wrapped teabags, since I often find a plastic bag containing the unwrapped tea bags. Individually wrapped teabags are particularly nice when traveling, and I plan to do a little of that soon. 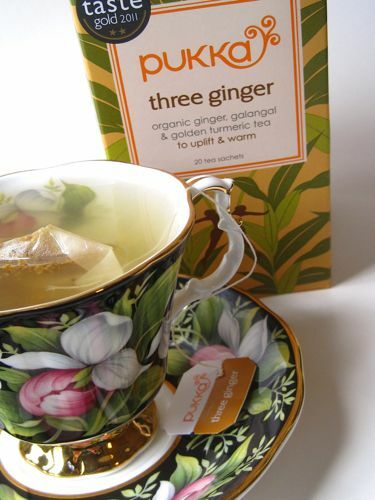 I was also pleased to find a very intense ginger flavor in this tea. 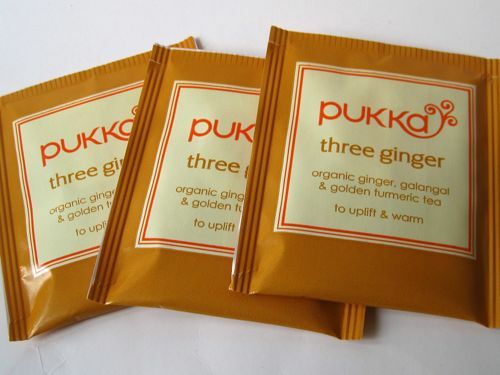 If you're a ginger fan as well, you might want to give this tea a try! As a bargain shopper, I find there are not that many brands I'm truly loyal to. I like to mix it up and try new things from the grocery store, for instance, so it's rare that I buy the same products week after week. When it comes to baking pans, however, I am quite, quite loyal to Nordic Ware. 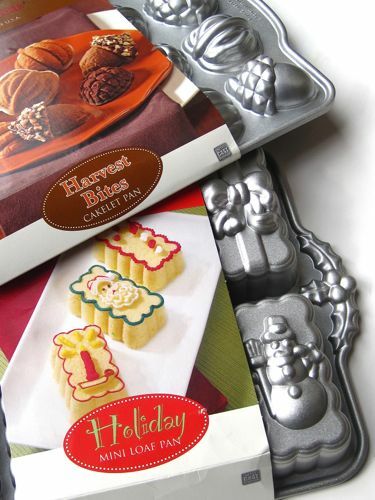 I've used their scone and cake pans for years, and earlier this week I wrote about my happy experience with a new Nordic Ware shortbread pan I received as a gift. It occurred to me, then, that I should probably let you know that most of my Nordic Ware pans are bought "out of season" and at bargain prices, like these two recent acquisitions. 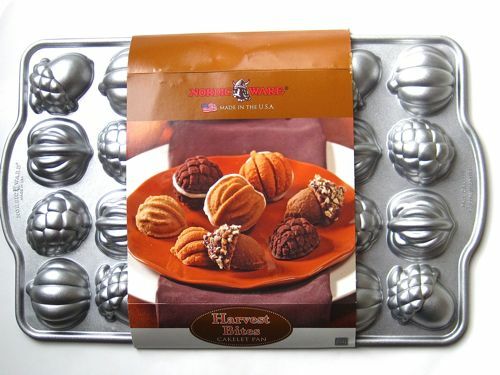 The Harvest Bites Cakelet Pan sells for $41.50 right now on the Nordic Ware website. I love the pretty autumn shapes you can use for cakes, or you can sandwich two of them together with frosting. 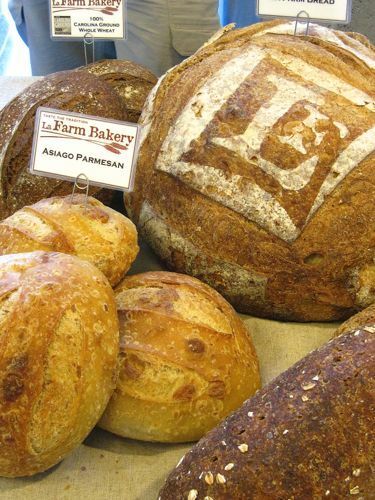 I'm also thinking of making a savory bread with mine, and then I can use the shaped bread for tea sandwiches. 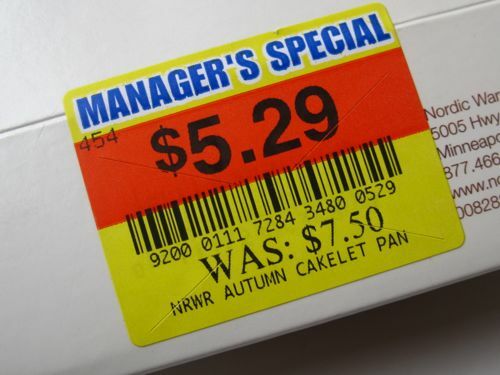 Whatever I end up doing with my Harvest Bites Cakelets, I'm very happy that I got my pan on clearance at Kroger in Carrollton the other day for just $5.29! 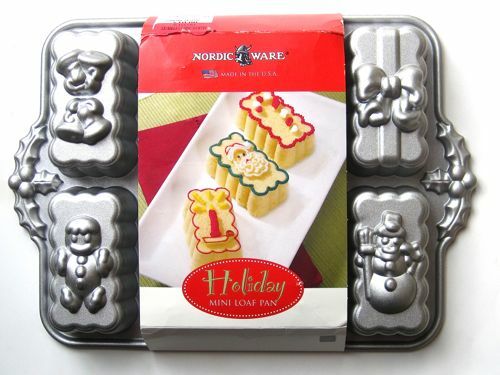 This week, I came across another Nordic Ware pan I'd not seen before, the Holiday Mini Loaf Pan which makes little loaves featuring Christmas designs. This pan (currently retailing for $36 on Williams-Sonoma's website) was on clearance at T.J. Maxx for just $10, but I actually got it for free since I had some T.J. Maxx rewards certificates to use. I do love having new Nordic Ware pans to look forward to using next fall and winter. If you're a fan of these products as well, be sure to visit the clearance aisle right about now! 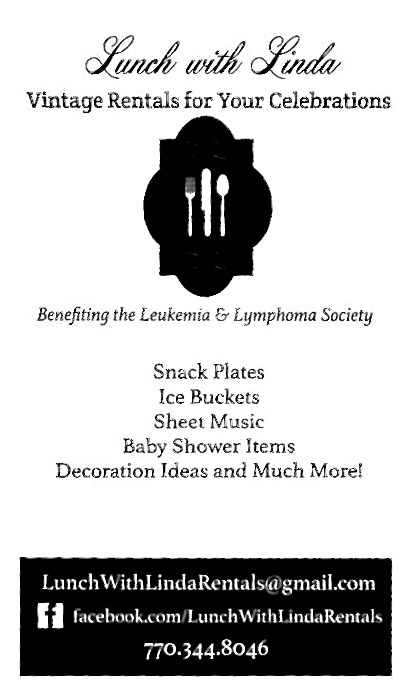 "Macarons, Cookies, Bars & Biscotti"